Happy Thursday! Today is the day I now associate with The Amazing Race…do any of you guys watch that show?! My sisters and I love it – it’s one of those few shows we watch all together, no matter what. And who doesn’t love a good snack on tv night? Today’s recipe is inspired by our sister night…maybe next week I’ll share our kettle corn recipe, if anyone is interested! 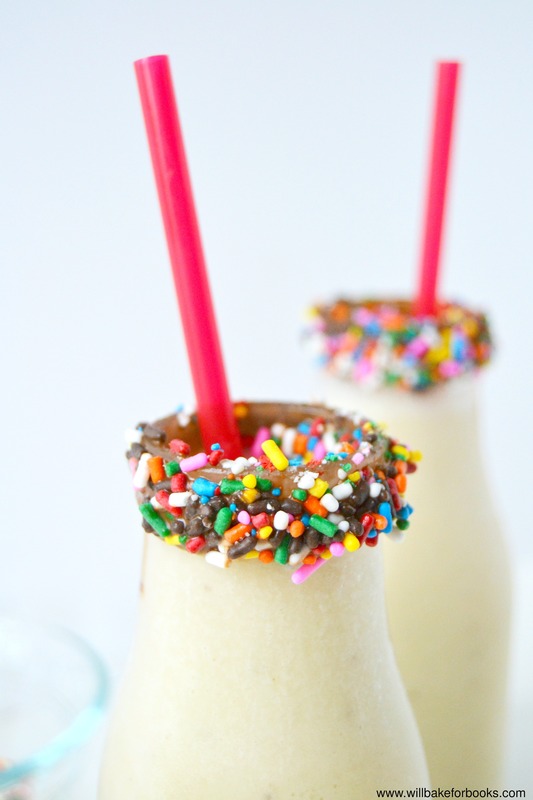 This Banana Milkshake has only 3 ingredients and is actually good for you. Bananas + almond milk + vanilla. That’s it. It’s creamy and feels indulgent, without actually being so! 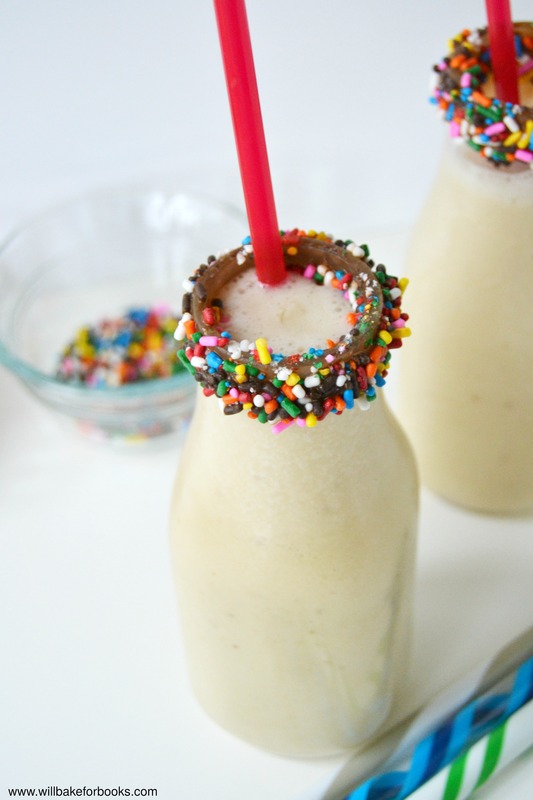 I like to slice and freeze my bananas before making this milkshake. That way the texture becomes like ice cream! Then I blend the heck out of those bananas until it’s super creamy. Next I add the almond milk and vanilla extract. 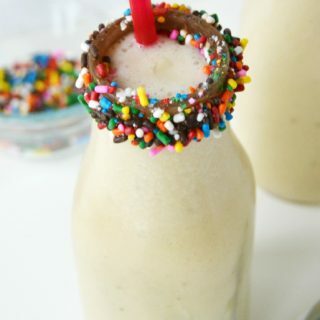 And if I’m feeling super fancy, I treat the glasses with my favorite chocolate (melted with coconut oil) and sprinkles. 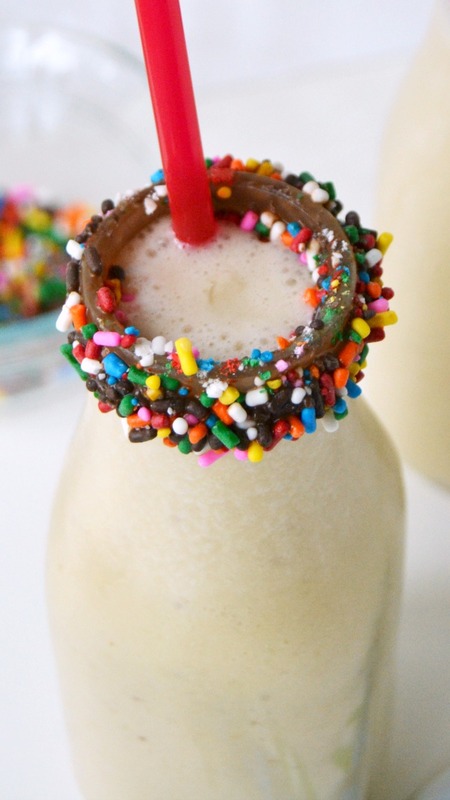 This milkshake feels indulgent without actually being so! Perfect for movie night. Slice and freeze two bananas (or four if doubling) in a freezer bag, with no air in it. Wait about 2 hours, more if you can wait. 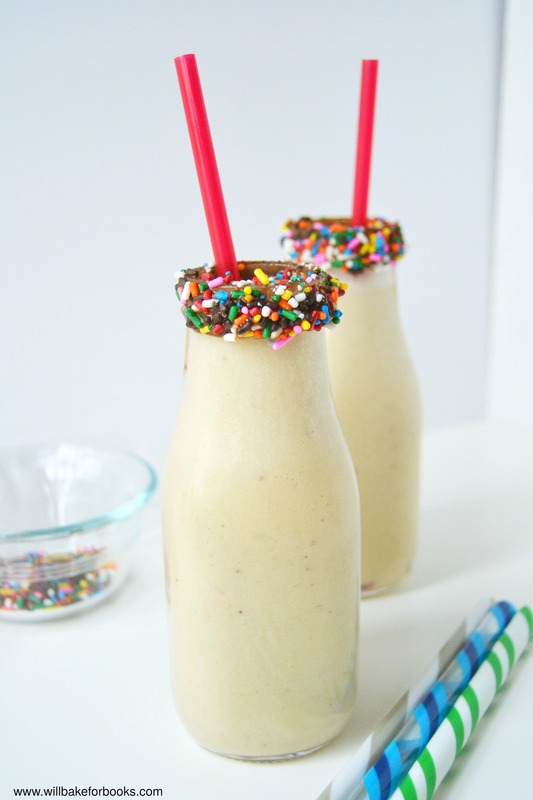 Blend bananas in a blender until very creamy, with no chunks in it, about 40-60 seconds. Add almond milk (1/3 to ⅔ depending on how sweet/less sweet you want it), vanilla, and ice; blend again until creamy. Serve! Optional topping: Melt 1 ounce chocolate and coconut oil in microwave in 30-second intervals until melted. Dip glasses into a small bowl with melted chocolate, then in another small bowl with sprinkles. Refrigerate for five minutes, then you're ready to pour your drink. Enjoy! Since I can't, I guess I'll just have to make it myself.